Julius Penson Williams is an African American composer, conductor, educator, recording artist, author and artistic director. His career is detailed at his personal website, http://www.juliuspwilliams.com Julius was born in the Bronx, New York City, in 1954. He earned a B.S. degree at Herman H. Lehman College of the City University of New York, and an M.M.E. degree at the Hartt School of Music. Williams has held faculty posts at several colleges and universities and is now Professor of Composition and Conducting at Berklee College of Music in Boston. He is also a co-director of the Videmus Recording Company. Dubrovnik Symphony Orchestra in Yugoslavia. On faculty at Berklee. He has conducted American orchestras in Dallas, New Haven, Savannah, Hartford, Sacramento, Tulsa, Knoxville, Oklahoma, The Vermont Symphony, The Norwalk Symphony, The Vermont Philharmonic, and Paducah Symphony in Kentucky, The Akron Symphony Orchestra, The Wooster Symphony of Ohio, the Armor Artist Chamber Orchestra, the Connecticut Opera Association and the Washington Symphony Orchestra of Washington, DC. The Tri-C Jazz Festival of Cleveland was opened by Maestro Williams in 1999 with a powerful performance of Duke Ellington’s “Sacred Service”. In Europe, Maestro Williams has performed and recorded with The Prague Radio Symphony, The Dvorak Symphony Orchestra, The Volvodanksa Symphony of Serbia, The Dubrovnik Symphony of Croatia, The Brno State Philharmonic, The Bohuslav-Martinu Philharmonic Orchestra, and The Music Festival of Costa del Sol, Spain. A prolific composer, Maestro Williams has created dozens of works for virtually every genre of contemporary classical performance, including opera, ballet, orchestra, chamber ensemble, chorus and solo voice, dance, musical theatre and film. The Cantata Easter Celebration was written in early 1993, as part of Williams' residency at Shenandoah University and Conservatory (Winchester, Virginia). There he served as Visiting Associate Professor and Jesse Ball duPont Scholar (academic year 1992-93). The Cantata is scored for orchestra, chorus, gospel choir, tenor, and dancers, and was premiered at Shenandoah, April 11, 1993. 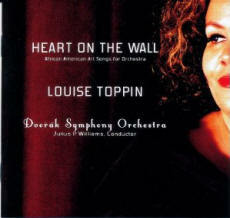 Shades of Blue: Symphonic Works of African American Composers, Troy 431 (2001) contains works of David Baker, H. Leslie Adams and Stephen Michael Newby. Julius Williams conducted the Prague Radio Symphony in performances of Baker's Shades of Blue and Adams' Ode to Life. Richard Taylor, baritone, and the Washington Symphony performed Newby's Gospel Songs for Baritone & String Orchestra under his direction. The piece is an example of "Third Stream," a phrase first coined by composer Gunther Schuller to describe the fusion of jazz and classical styles and where the crossover from one to another in the course of the piece is blurred and often imperceptible. 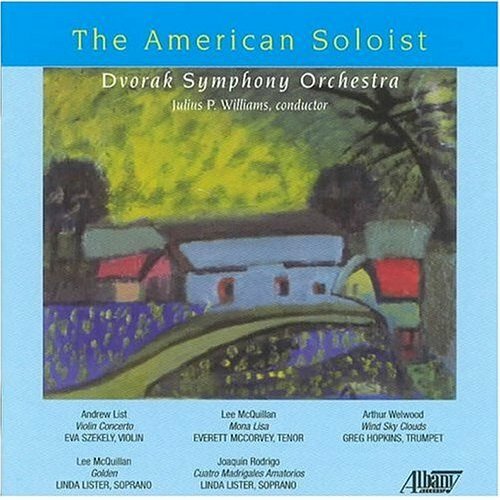 Julius P. Williams conducts the Dvorak Symphony Orchestra on Troy 704 (2004). The works are Symphony for Chamber Ensemble of Leroy Southers; Romanza for Solo Violin and Orchestra of Lee McQuillan, with Peter Zdvihal, violin; Golden Fanfare of Beth Denisch; and Symphony No. 1 of Jack Jarrett. 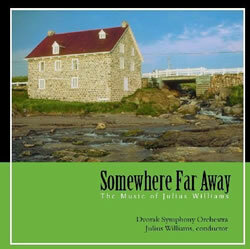 On the CD Somewhere Far Away, Troy 1072 (2008), all three works are performed by the Dvorak Symphony Orchestra and conducted by Julius Williams. Joe Westmoreland is composer of the work Somewhere Far Away. Other artists on the piece are Gabrielle Goodman, soprano; Armstead Christian, tenor; Dr. Roy L. Belfield, Jr., piano; and the Winston Salem State University Choir. Julius P. Williams is composer of Toccatina for String Orchestra and A Journey to Freedom Honor and Glory, An American Hero John Daniels. Performers of the final work are Louise Toppin, soprano; Desire Dubose, mezzo-soprano; Julius Williams, tenor; the Reston Chorale; Fred Wygal, narrator; and the Winston Salem State University Choir. Compositions published by MMB, Augsburg Fortress, Carl Fischer, Warner Brothers, and Lawson-Gould. Compositions performed by New York Philharmonic, Cleveland Orchestra, Dallas Symphony, and many orchestras nationally and internationally. He has served as Composer-in-Residence of Connecticut’s Nutmeg Ballet Company, which premiered his ballet, Cinderella. His Norman Overture was premiered by the New York Philharmonic, conducted by Zubin Mehta. The opera Guinevere was performed at the Aspen Music Festival and at Dubrovnik Music Festival in Croatia. He is composer of the score for the film What Color is Love?, the score for the play In Dahomey and the choral piece A Journey to Freedom for the Reston Choral and Festival Orchestra in Virginia. The moving tribute to the victims of September 11, In Memorium was premiered by the Detroit Symphony. Maestro Williams has served as conductor-composer of the Connecticut Arts Award for Public Television. His film score for Lifetime TV’s Fighting for our Future won the Gracie Allen Documentary Award in 2003. 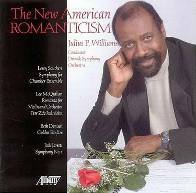 Julius P. Williams plays an active role in current affairs related to classical music composition and performance. On an international level, he was selected by the Shanghai Conservatory of Music as one of two Final Jurors in the 2009 Rivers Composition Competition. The other Final Juror was Prof. Alexander Koblyakov, Dean of the Moscow Conservatory in Russia. Another example is his role, along with Kenneth Harris, Sr., another African American composer and conductor, in organizing a concert at Alice Tully Hall in Lincoln Center for Oct. 21, 2009. The Longar Ebony Symphony Orchestra was joined by talented soloist of African descent for a program of Coleridge-Taylor Perkinson and Aaron Copland, among others. Cinderella, ballet. Première: Connecticut, Nutmeg Ballet Company; Julius P. Williams, conductor. Easter celebration (1993). Duration: 5:54. ----- 2. Is it true? (1993). Duration: 3:36. CD: Everett McCorvey, tenor; Bohuslav Martinu Symphony; Julius P. Williams, conductor. Albany TROY 104 (1993, Symphonic brotherhood). 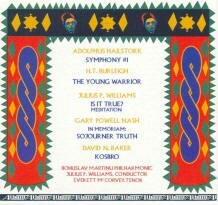 CD: Bohuslav Martinu Symphony; Julius P. Williams, conductor. Albany TROY 104 (1993, Symphonic brotherhood). Guinevere, opera. Première: 1889 OR 1990? ; Dubrovnik Festival; Dubrovnik Symphony Orchestra; Julius P. Williams, conductor. In roads, for flute, oboe & violoncello (1987). Norman overture. Première: New York Philharmonic; Zubin Mehta, conductor. Sounds of colors, for organ. Toccatina, for string orchestra. Commission: Camerata Youth Orchestra. Banfield, William C. Landscapes in color; conversations with Black American composers. Landham MD: Scarecrow Press, 2003. xvi, 380p. ISBN 0-8108-3706-4. Black perspective in music v18, p242, 245.